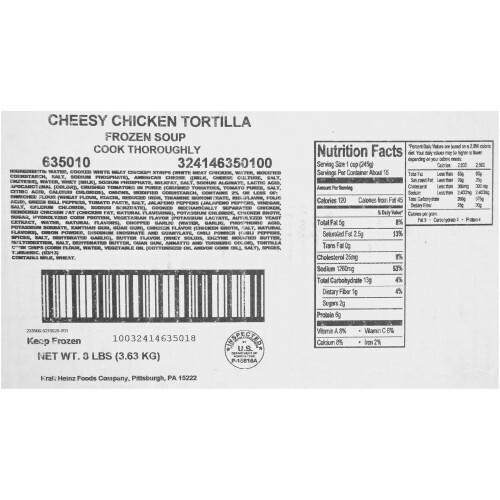 Chef Francisco Cheesy Chicken Tortilla Soup, 8 lb. 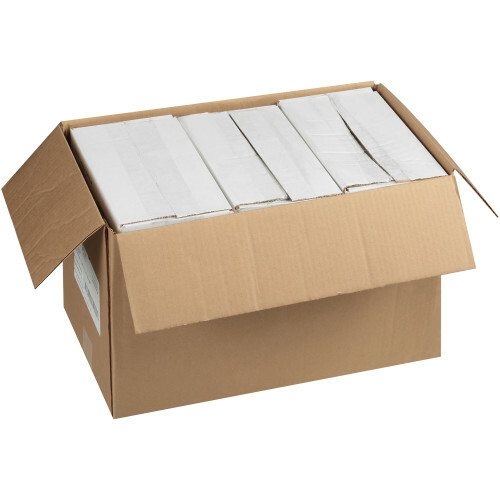 Bag, 6 Count. A rich tomato and cheese broth loaded with chicken and Mexican spices. Garnish this with crumbled tortilla chips, shredded cheese and more! Chef Francisco by Heinz pioneered the concept of frozen soup more than 30 year ago. Heinz understands your need for convenient foods that deliver on nutrition, value and versatility. Who can do all that? Heinz Soups can. Our soups can be your partner in the kitchen, helping you solve the challenges you face every day. With cost-effective options that allow you to be creative in the kitchen for your family, Heinz Soups help you to satisfy nutrition program requirements while you create a multitude of appealing and delicious recipes. Discover Heinz Soups. Meet the demands of USDA guidelines for child nutrition with a variety of soups that can satisfy meal equivalent needs and meet today’s lower-sodium menu requirements—whether served as is, or as an integral part of a tasty recipe. 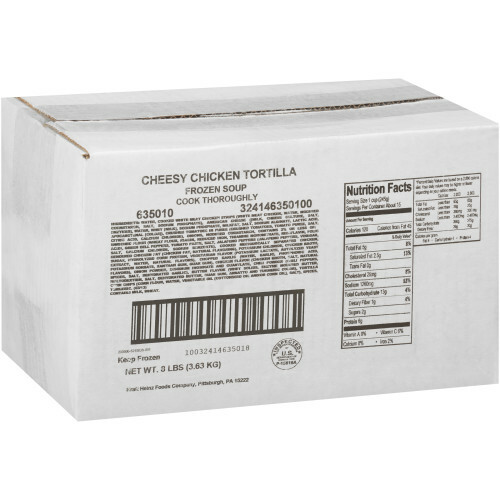 Ingredients: ingredient:water, cooked white meat chicken strips (white meat chicken, water, modified cornstarch, salt, sodium phosphate), american cheese ([milk, cheese culture, salt, enzymes], water, whey [milk], sodium phosphate, milkfat, salt, sodium alginate, lactic acid, apocarotenal [color]), crushed tomatoes in puree (crushed tomatoes, tomato puree, salt, citric acid, calcium chloride), onions, modified cornstarch, contains 2% or less of: enriched flour (wheat flour, niacin, reduced iron, thiamine mononitrate, riboflavin, folic acid), green bell peppers, tomato paste, salt, jalapeno peppers (jalapeno peppers, vinegar, salt, calcium chloride, sodium benzoate), cooked mechanically separated chicken, rendered chicken fat (chicken fat, natural flavoring), potassium chloride, chicken broth, sugar, hydrolyzed corn protein (contains soybean oil), vegetarian flavor (potassium lactate, autolyzed yeast extract, water, natural flavors), chopped garlic (water, garlic, phosphoric acid, potassium sorbate, xanthan gum, guar gum), chicken flavor (chicken broth, salt, natural flavors), onion powder, disodium inosinate and guanylate, chili powder (chili peppers, spices, salt, dehydrated garlic), butter flavor (whey solids, enzyme modified butter, maltodextrin, salt, dehydrated butter, guar gum, annatto and turmeric color), tortilla corn chips (corn flour, water, vegetable oil [cottonseed oil and/or corn oil], salt), spices, turmeric. HEINZ Reduced Sodium Cream of Mushroom Soup, 49.5 oz. Can, 12 Count. A smooth, easy to blend, cream based soup prepared with fresh diced mushrooms and selected seasonings. 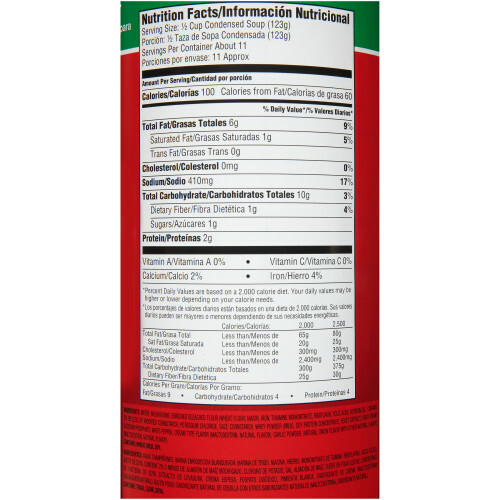 HEINZ Reduced Sodium Cream of Chicken Soup, 49.25 oz. Can, 12 Count. These are the famous soups we all grew up with. Their very names conjure up images of hugging a steaming bowl while warming your toes by the fire - Heinz Cream of Tomato, Vegetable and Cream of Chicken to name but three. Classics in every sense. Heinz understands your need for convenient foods that deliver on nutrition, value and versatility. Who can do all that? Heinz Soups can. Our soups can be your partner in the kitchen, helping you solve the challenges you face every day. With cost-effective options that allow you to be creative in the kitchen for your family, Heinz Soups help you to satisfy nutrition program requirements while you create a multitude of appealing and delicious recipes. Discover Heinz Soups. Meet the demands of USDA guidelines for child nutrition with a variety of soups that can satisfy meal equivalent needs and meet today’s lower-sodium menu requirements—whether served as is, or as an integral part of a tasty recipe. Heinz Chicken Noodle Soup is made with a blend of the finest ingredients to make sure this classic soup remains a family favorite. Heinz understands your need for convenient foods that deliver on nutrition, value and versatility. Who can do all that? Heinz Soups can. Our canned soups can be your partner in the kitchen, helping you solve the challenges you face every day. With cost-effective options that allow you to be creative in the kitchen for your family, Heinz Soups help you to satisfy nutrition program requirements while you create a multitude of appealing and delicious recipes. Discover Heinz Canned Soups. Meet the demands of USDA guidelines for child nutrition with a variety of soups that can satisfy meal equivalent needs and meet today’s lower-sodium menu requirements—whether served as is, or as an integral part of a tasty recipe. 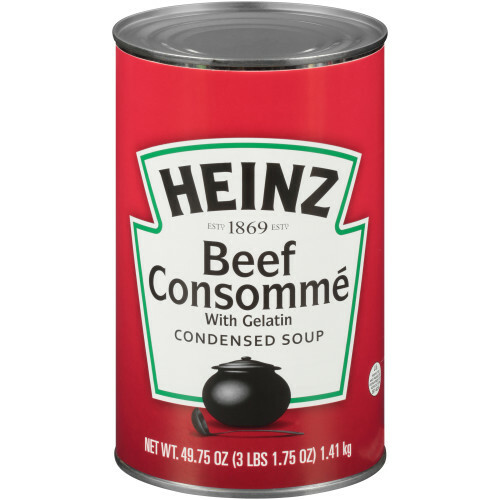 Heinz Condensed Beef Consommé - 49.75 oz. cans, 12 per case Canned condensed soup - A light, clear soup prepared from rich beef stock and seasonings. Gelatin is added for increased versatility. 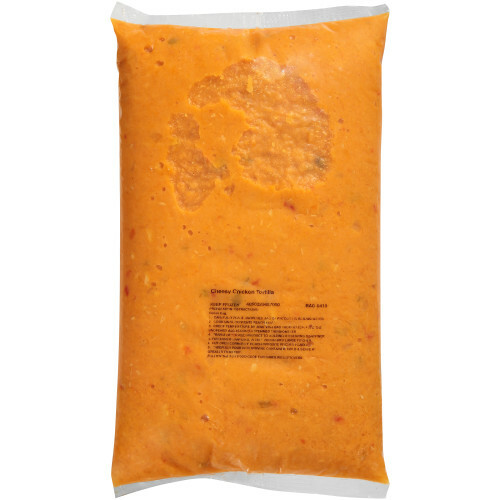 Heinz condensed soups are reconstituted on a one-to-one ratio by adding water. Heinz understands your need for convenient foods that deliver on nutrition, value and versatility. Who can do all that? Heinz Soups can. Our canned soups can be your partner in the kitchen, helping you solve the challenges you face every day. With cost-effective options that allow you to be creative in the kitchen for your family, Heinz Soups help you to satisfy nutrition program requirements while you create a multitude of appealing and delicious recipes. 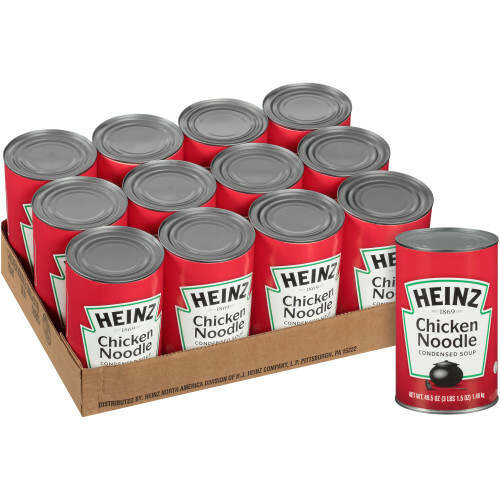 Discover Heinz Canned Soups. Meet the demands of USDA guidelines for child nutrition with a variety of soups that can satisfy meal equivalent needs and meet today’s lower-sodium menu requirements—whether served as is, or as an integral part of a tasty recipe. 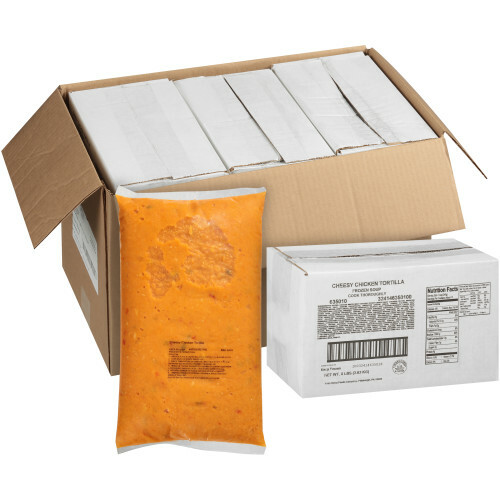 Chef Francisco Lobster Crab Bisque Soup, 4 lb. Tub, 4 Count. hef Francisco Lobster and Crab Bisque - 4 lb. 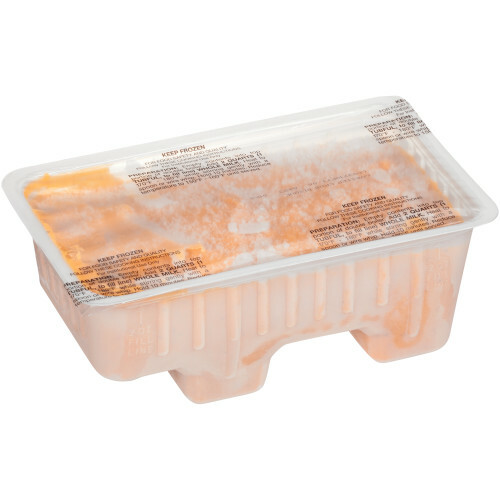 tub, 4 per case Juicy crab and sweet, tender lobster are gently simmered in a light creamy tomato broth flavored with a savory cheese, onions, paprika and a splash of sherry wine. 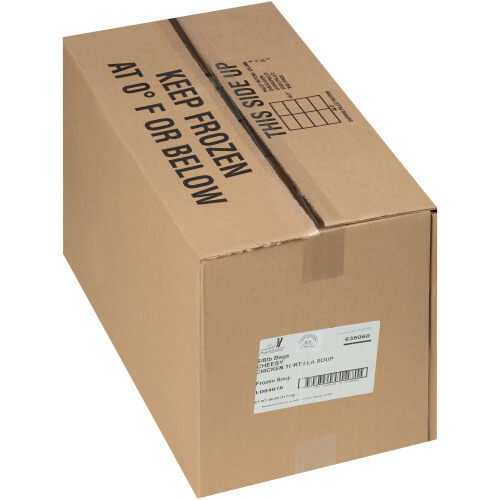 Frozen, Condensed Chef Francisco by Heinz pioneered the concept of frozen soup more than 30 year ago. Heinz understands your need for convenient foods that deliver on nutrition, value and versatility. Who can do all that? Heinz Soups can. Our soups can be your partner in the kitchen, helping you solve the challenges you face every day. With cost-effective options that allow you to be creative in the kitchen for your family, Heinz Soups help you to satisfy nutrition program requirements while you create a multitude of appealing and delicious recipes. Discover Heinz Soups. Meet the demands of USDA guidelines for child nutrition with a variety of soups that can satisfy meal equivalent needs and meet today’s lower-sodium menu requirements—whether served as is, or as an integral part of a tasty recipe.